(Jan. 27, 2013) — Former governor of Utah, 2012 presidential candidate and former U.S. Ambassador to China and Singapore Gov. 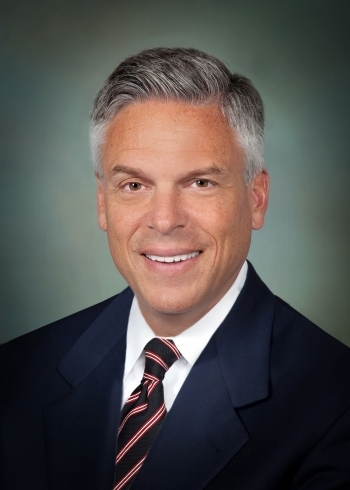 Jon Huntsman will visit the University of Kentucky next month. His talk, “China: Opportunities and Challenges,” will take place at 7 p.m. Thursday, Feb. 20, in UK’s Memorial Hall. While tickets are required for entry, the event is free and open to the public. Huntsman will discuss his years of experience working closely with American business owners to facilitate commerce in the growing Asian market, and outline ways to bring jobs and capital back to America, engage China from a position of strength and level the economic playing field in order to protect the U.S. economy. View a flyer about the event. Huntsman began his career in public service as a staff assistant to President Ronald Reagan. He has since served four U.S. presidents in critical roles around the world, including ambassador to Singapore, deputy assistant secretary of commerce for Asia, U.S. trade ambassador and most recently U.S. ambassador to China. Twice elected as Utah's governor, Huntsman brought about strong economic reforms, tripled the states rainy day fund and helped bring unemployment rates to historic lows. During his tenure Utah was named the best managed state in America and best state in which to do business. Recognized by others for his service, Huntsman was elected as chairman of the Western Governors Association, serving 19 states throughout the region. Huntsman ran as a candidate for the 2012 Republican Presidential nomination. He now serves as co-chair, along with Sen. Joe Manchin (D-W.Va.), of No Labels, a growing citizens’ movement of Democrats, Republicans and everything in between dedicated to promoting a new politics of problem solving. He also serves on the board of Ford Motor Company, Caterpillar Corporation, Huntsman Corporation, the U.S. Naval Academy Foundation, the University of Pennsylvania, as a distinguished fellow at the Brookings Institute, a trustee of the Reagan Presidential Foundation, and as chairman of The Huntsman Cancer Foundation. UK Assistant Professor of Chinese Literature and Culture Liang Luo hopes students will be inspired by Governor Huntsman's extensive experience learning Mandarin Chinese and living in a wide-range of Chinese-speaking Asian regions, including Taiwan, Singapore and Mainland China. “With the U.S. and China being the top two economies of the world, I hope our students will realize how knowledge of Chinese language and culture will be vital in creating and maintaining a mutually beneficial relationship between the two countries, and how they can lead the effort by majoring or minoring in Chinese studies at UK, and taking part in our summer intensive language program in Shanghai,” said Luo. Tickets are available at the Student Involvement Ticket Center (room 253 in the UK Student Center) or on Ticketmaster.com (a processing fee is charged if using Ticketmaster). Any remaining tickets will also be available at Memorial Hall the night of the event. The Office of the President, UK International Center and the UK Confucius Institute are sponsoring Huntsman’s visit.